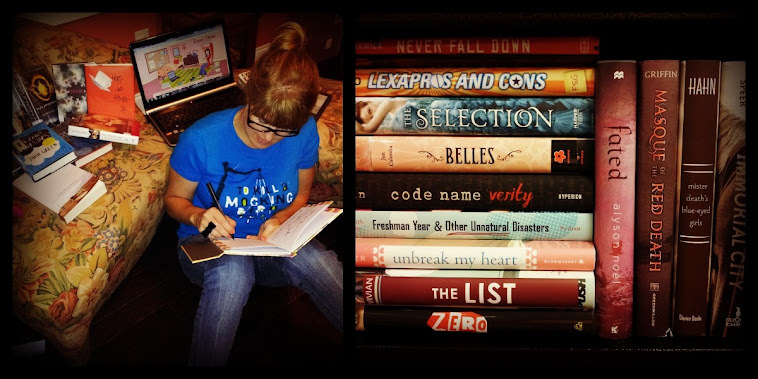 Books that address body weight issues will forever be popular because, thanks to peer pressure/the media/magazines/infomercials/the culture of celebrity, body weight issues will forever be with us. Is there a female out there who doesn't obsess about her weight? Whether you're a size 2 or size 22, it's like females are born with a 'I-will-never-be-satisfied-with-my-weight' gene - it kicks in with our hormones around age 10 or 11...and never lets up. Of course, females don't have a lock on weight obsession. I have a nephew who went on a purging binge his 8th grade year to try and rid himself of his 'blubber' as he called it. As with most weight issues, there were some other things going on at home that triggered this terrible time in his life - thankfully, with the encouragement of his family, he got some outside psychological help and, now a senior in high school, is doing much better. In the past, Y.A. 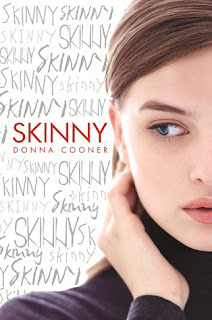 novels that address body weight issues have pretty much stuck to anorexia and bulimia, but with Donna Cooner’s Skinny, we can now add obesity and the effects of Gastric Bypass surgery to the lexicon. Skinny is the voice inside Ever Davies’s head that constantly reminds her she’s anything BUT skinny. Ever doesn’t need her dad, stepmom, stepsisters, and classmates to comment aloud when Skinny is always there to pass judgment for them. Y’see, when Ever was in middle school, her mother died from a sudden sickness and her dad remarried a woman with two perfect daughters, leaving Ever to cope with her sadness by eating her way up to 302 pounds. Her best and only friend, a nerdy boy named Rat, encourages Ever to take drama and try out for the school musical. Ever loves musicals and has a knock-out voice, one that even cute guy Jackson would take notice of if he could see past her rolls of fat and listen to her sing, but then that’s the thing – Ever allows her low self esteem to hold her back from pursuing the things she loves. In Ever’s experience, she seems to generate two reactions from the ‘normal’ kids – invisibility or revulsion. Most girls want nothing to do with her, afraid her ‘gross obesity’ will rub off on them, while guys take no notice of her at all except for the occasional douches/cowards who hurl insults from passing cars. Ever does her best to remain invisible - she sits at the back of class, never volunteers answers, keeps to herself after school - but then one day she’s at a school awards ceremony and the worst thing possible happens – the chair she’s sitting in actually BREAKS…onstage…in front of everyone. Skinny is quick to verbalize exactly what the shocked and horrified faces of those classmates and teachers surrounding her are thinking. Mortified beyond measure, the public humiliation is enough to drive Ever to make a change and try to lose the weight. How? Gastric Bypass surgery. Cooner, a former Gastric Bypass patient herself, knows firsthand the range of emotions and physical changes that that come with this difficult medical procedure. There’s nothing easy about the surgery, from the procedure itself to the change in eating habits – no sugar in the diet, no water while eating or you’ll be too full for food, the need to chew your food into nothingness because you only get 3 tablespoons of food…total! For the surgery to be a success, exercise is also a must and patients are warned it can take more than a year before a desired weight is reached…if then. Determined, Ever does as the doctor orders and, sure enough, starts to shed the pounds. Unfortunately, Skinny still has some things to say. Even as her classmates take notice of her shrinking form and praise her for the weight loss, the sadness and insecurities that got Ever up to 302 pounds in the first place don’t automatically disappear post-surgery. As Skinny is quick to point out, can these same people who ignored and hurled insults at her when she was heavy truly be her friends now just because she’s several sizes smaller? To her credit, Cooner also doesn’t write Ever as some misunderstood saint – Ever may have been discriminated against in the past for her size, but she’s guilty herself of having wrongly judged the motives of others who tried to befriend or help her along the way. This realization is what helps Ever grow stronger in her sense of self-worth and in her relationships with others. Best of all, by learning to love who she is – flaws and all - she’s finally able to quiet Skinny…forever. Eighteen-year-old Lia struggles to come to terms with her best friend's death from anorexia as she struggles with the same disorder. Following the death of her father, Isabelle uses bulimia as a way to avoid her mother's and ten-year-old sister's grief, as well as her own. When her parents check sixteen-year-old Janie into Golden Slopes to help her recover from her bulimia, she discovers that she must talk about things she has admitted to no one--not even herself. Describes a young man's battle with bulimia in a Jewish family and his struggle is confronted by family and friends and the pain of his father's cancer. Kessie thinks she's overweight. She's five foot four and ninety-eight pounds. A now-classic that tells of one girl's struggle with anorexia nervosa. 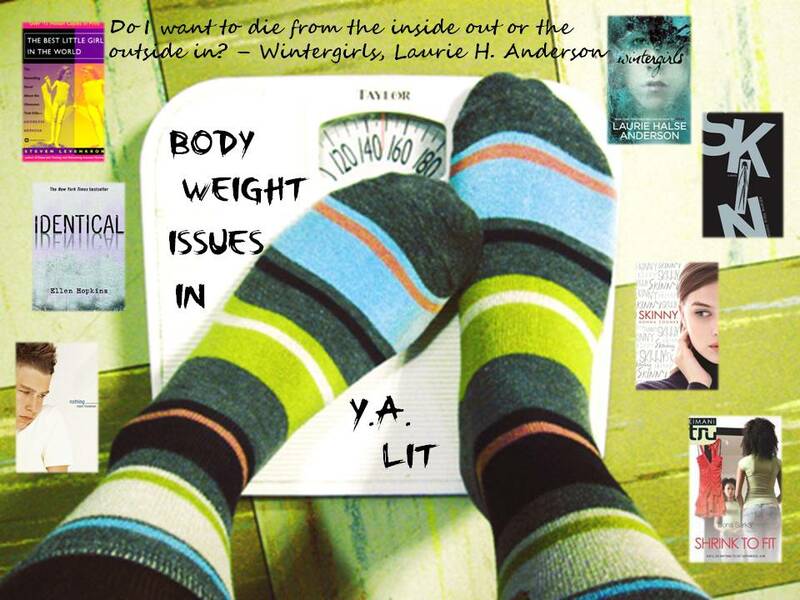 Originally trying to lose only a few pounds, seventeen-year-old Emily's weight loss spins out of control as she develops eating disorders until she decides that trusting in God and her friends can help her regain her health. The death of their father, two sisters struggle with various issues, including their family history, personal relationships, and an extreme eating disorder. Basketball star Leah Mandeville believes that losing weight and becoming superthin will solve everything wrong in her life, and, reaching her goal, discovers that her "perfect body" comes with a whole new set of problems. Seventeen-year-old Lisabeth has anorexia, and even turning into Famine--one of the Four Horsemen of the Apocalypse--cannot keep her from feeling fat and worthless. Great post. Another book to add to your list of YA dealing with body issues is 'Fat Cat' by Robin Brande and 'My Big Fat Manifesto' by Susan Vaught.